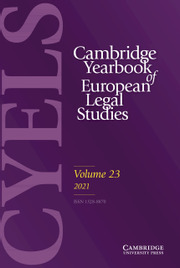 The Cambridge Yearbook of European Legal Studies (CYELS) offers authors and readers a space for sustained reflection and conversation about the challenges facing Europe and the diverse legal contexts in which those challenges are addressed. It identifies European Legal Studies as a broad field of legal enquiry encompassing not only European Union law but also the law emanating from the Council of Europe; comparative European public and private law; and national law in its interaction with European legal sources. The Yearbook is a publication of the Centre for European Legal Studies, Faculty of Law, University of Cambridge. The Impact of the EU Charter of Fundamental Rights on Anti-Discrimination Law: More a Whimper than a Bang? Proportionality in EU Law: A Balancing Act?